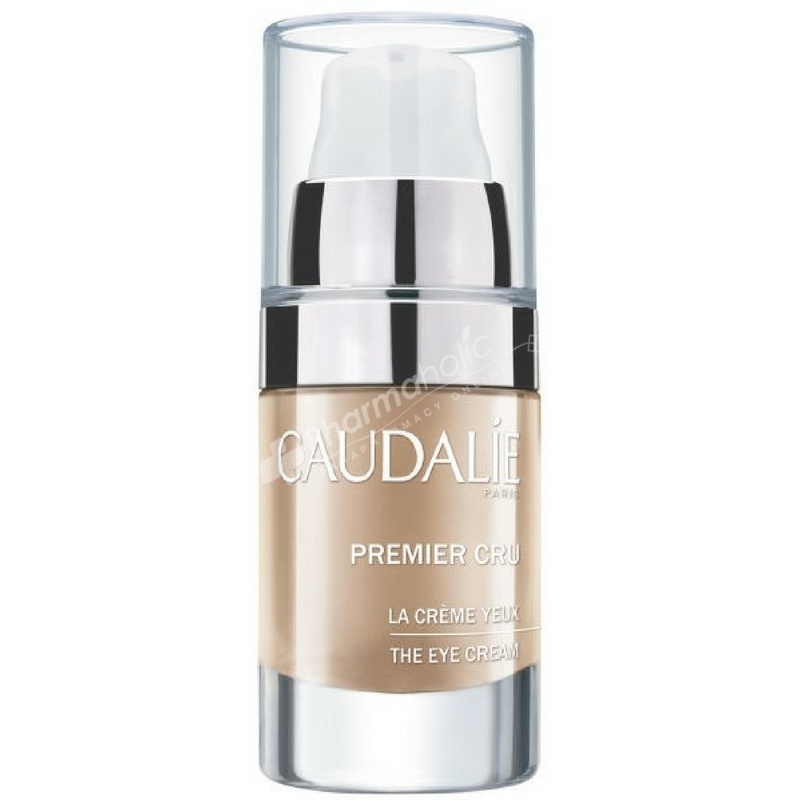 Caudalie Premier Cru The Eye Cream offers ultimate antiaging action for instantly transformed eyes. Perfectly hydrated, the skin is smoother and firmer. Dark circles and puffiness fade away and the eye area is brightened with renewed youth. This luxurious and efficient cream provides a complete anti-ageing action for the delicate eye contour area. Its velvety texture is absorbed by the skin to provide unique comfort and immediate beautifying results. Premier Cru is an exclusive assemblage of the rarest, the most precious and the most efficient natural active ingredients for the skin. Its silvered pearly,coppered and iridescent effect to the eyes immediately enlight the eyes. Day after day, the zones of shadow and imperfections are eliminated, they don't need to be hidden under make-up anymore. Dark circles and puffiness fade away, the eye contour becomes smoother and lifted and the look becomes radiant. Fragrance-free. Ophthalmologist tested. Paraben free, 0% Phenoxyethanol, 0% phthalates, 0% mineral oils, 0% sodium laureth, 0% animal ingredients. Apply morning and avaning to the eye contour. Also ideal to the lips contour. Aqua, Butylene Glycol, Cetearyl Alcohol*, Ethylhexyl Stearate*, Cyclopentasiloxane, Glycerin*, Triisostearin*, Polymethyl Methacrylate, Bis-Behenyl/Isostearyl/Phytosteryl Dimer Dilinoleyl Dimer Dilinoleate*, PEG-20 Stearate*, CI 77891* (Titanium Dioxide), Imperata Cylindrica Root Extract*, CI 77019 (Mica), Hydrogenated Avocado Oil*, Hydrogenated Olive Oil Stearyl Esters*, Silica, Vitis Vinifera (Grape) Seed Oil, Palmitoyl Grape Seed Extract*, Tocopheryl Acetate*, Hydrolyzed Hibiscus Esculentus Extract*, Dextrine*, Caffeine*, Benzyl Alcohol, Propyl Grapevine Shoot Extract Olivate*, Caprylyl Glycol, Coffea Arabica (Coffee) Seed Extract*, Carbomer, Palmitoyl Grapevine Shoot Extract*, Xanthan Gum, Tocopherol*, Lecithin*, Hyaluronic Acid, Dehydroacetic Acid, Sodium Hydroxide, Polysorbate 20, Sodium Carboxymethyl Betaglucan, Acetyl Tetrapeptide-5, Tin Oxide, Acrylates/C10-30 Alkyl Acrylate Crosspolymer, Palmitoyl Oligopeptide, Palmitoyl Tetrapeptide-7. Active Ingredients: Vinolevure brevetée, acides hyaluroniques, huile de pépins de raisin, tetra et oligo peptides, beurre d'avocat.